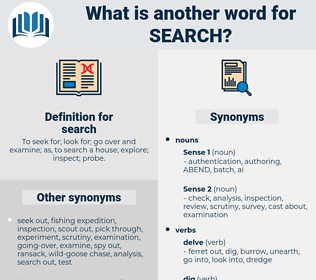 What is another word for search? To seek for; look for; go over and examine; as, to search a house; explore; inspect; probe. going over with fine-tooth comb. Searched, searching, recherche, look-up, lookup. Searchable, pursuit, researches, researching, researcher, Researchers. Searchable, researches, researching, researcher, searchability. technologies, Activities, partners, centres, Facilities, products, topics, Policies, Grants, finds. caches, articles, Publications, documents, Standards, awards, Soldiers, discusses, linkages, items, Grants, data, mulls, IMPACTS, recherche, investigation, investigations, finding, seek, seeks, finds. Discoveries, Efforts, seekers, attempts, experiments, Fellowships, files, Universities, topics, investigations, seek, seeks, finds. Criteria, Policemen, data, Registries, recherche, investigation, finding, raid, pursuit, seek, Checking, effort, gathering, seizure, achievement, endeavour, lookout, trespass. Retrieved, Raided, executed, conducted, led, Visited, Took, recherche. Discovering, Chasing, Sourcing, striking, finding. traced, Administered, Achieved, shared, addressed, Retrieved, identified, Examined, concerned, seen, established, requested, reviewed, supported, hunted, Urged, Aimed, dedicated, published, supposed, Carried, derived, stored, conducted, applied, developed, focused, based, designed, Looked, built, taken, funded, needed, Got, done. investigates, strives, pursues, identifies, desires, tries, aims, works, attempts, wants, goes, seeks. excavate, raid, seek, retrieve, discover, lookingfor, endeavour. Do not they rather go in search of him? We will search the land. sewerage, screaky, squaw grass, sayers, saururaceae, siriasis, squarish, sorex, serax, scherzo, scissors, scrag, scheuchzeriaceae, scarce, sciurus, sack race, source, sea horse, seahorse, scores, sourish, seiurus, shag rug, siris, scourge, Sargasso Sea, SARS, sorus, screw key, sargasso, saurischia, ski rack, Skagerrak, siqueiros, shire horse, serous, sirocco, serious, ski race, scissors kick, scorsese, scrooge, sorgho, secrecy, sucrose, sewer gas, sea wrack, scorch, screw jack, SIRC, sugar cookie, seagrass, surcease, shakers, shrug, series, shrewish, syracuse, saururus, scraggy, saurosuchus, scours, susurrus, shriek, shrike, sarawak, Showy Orchis, squark, surge, sorgo, squirearchy, sazerac, skew arch, sirius, screak, sawhorse, sucrase, shiraz, sericeous, saccharase, skreak, sewage works, skreigh, shark, Sirach, sage grouse, serosa, screech, serge, susurrous, saragossa, screechy, siracusa, shears, saccharose, Skagerak, sikorsky, shirk. manhunt, frisking, exploration, foraging, quest, ransacking, scouring, seeking, shakedown, looking, rummage, looking for, forage, frisk. ransack, rifle, comb, go, rummage, strip-search, scan, frisk, raid. hunt, cruise, nose, poke, prospect, pry, horn in, intrude. examination, scrutiny, investigation, investigating, activity.